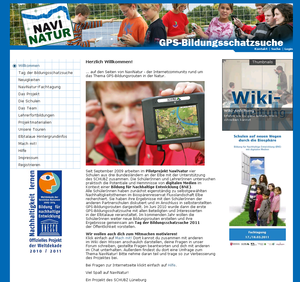 From September 2009 until March 20011 four schools in or close to the Biosphere Reserve Elbtalaue (Lower Saxonian Elbe Valley) are involved in the project NaviNatur Elbtalaue and as well as the Biosphere Reserve the project was state-crossing. From Lower-Saxony the Gymnasium Bleckede and the Gymnasium Lüchow are involved. The grammar school complex Fritz-Reuter Dömitz is located in Mecklenburg-Vorpommern and the Marion-Dönhoff-Gmynasium Mölln in Schleswig Holstein. We have archived the website of the previous project for you. Under http://navinatur.de/t3 you can get an impression of the previous project from NaviNatur international. Please note that no changes will be done on the old website and that the website is available only in German language. Even the logins for the old site was deactivated. Please use the new tools (forum, wiki, chat). You can transfer the previous contents to the new tools.